A lone bear enacts one half of a faithful friendship. Bear, a friendly-looking ursine with light brown fur, saucer eyes, and a pointy snout “has been sitting and waiting since dawn” at a bus stop next to a cherry tree. 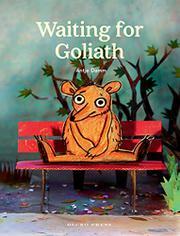 He’s “waiting for Goliath,” he tells the world at large. Damm constructs her scene in three dimensions, a painted twig with flowers pasted on standing in as the tree, and cut, painted pieces of cardboard acting as grass and shrubbery as well as the bench Bear sits on. Bear himself is drawn on paper that’s cut and sometimes articulated, so he can be posed realistically (and humorously). Although the perspective never changes, readers will be transfixed by the diorama, watching how shadows cast by the grasses change as first hours and then seasons go by. A robin raises a family in the tree, which blossoms, bears fruit, and then drops its leaves before winter comes. And still, there’s no Goliath—indeed, “sometimes Bear forgets that he is waiting for Goliath.” When he wakes up the next spring following hibernation, “he hears a faint noise like a hand sliding slowly across paper. Goliath is coming!” Adult readers may be astonished when Goliath appears, unlike Godot; child readers will simply be charmed to see that Goliath is a snail. With not a hint of irritation, Bear finally leaves his post with Goliath to play.